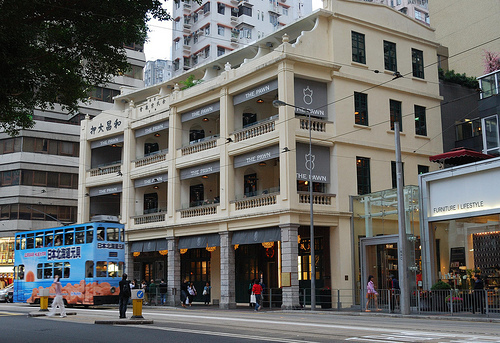 After posting the write-up of dinner at The Pawn in Wan Chai, which is located in a nearly 100-year old building, Angel happened to find a picture of the building from the 1960s. Makes for a fascinating comparison. And a picture from the 1960s. What most strikes me is that you can see the hills behind Wan Chai – no skyscrapers! Standing in front of the building today, you have no sense of the nearby geography, only the sheer vertical nature of the cityscape. This entry was posted in Uncategorized and tagged 1960s, hong kong, Wan Chai by christao408. Bookmark the permalink. Oh, that’s neat. I am sure the landscape must have changed a lot between 1960 and today. That’s almost half a century ago! Amazing! There’s a walking bridge up the hill, I think that’ll lead to the Peak. All I can say is “Wow” what a change! The differences in landscape really do seem a great deal more dramatic than even the changes in the building. Pity that the nature is erased for such development! The least that building still stands! Wow! Honolulu is kind of going that way too. It’s always interesting looking at how things have changed. I don’t know if there is anymore room for development anymore in HKG. Thanks to the internet…. and have found this pic after a few clicks…..
wow. look at that. i have found a new respect for the building now that you have shared this. thanks for the history lesson, chris. They don’t look like the same building at all. Nice. @agmhkg – You are my Google expert. 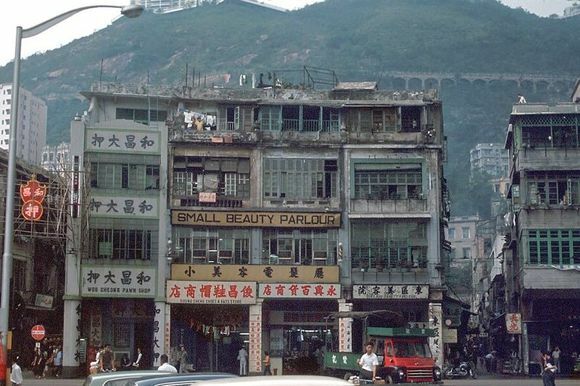 LOL@stepaside_loser – You have to clear away the gating and the windows in the 1960s picture to see the beautiful balconies. @rudyhou – ‘Bout time you show that building some respect, Rudy! =P LOL@grannykaren – Pretty sure the top story was there all along. You can see the half-height walls on the top story in both pictures. @ElusiveWords – One word: landfill. No, seriously, there is a lot of new development finally happening around the old Kai Tak airport property. Surprised it took so long. @n_e_i_l – Thank goodness the mountains can still be seen from most areas. For now…@SherryAngeLMysteriez – Erased or hidden… at least there is still a nice network of parks, trails, and open spaces even on Hong Kong Island. @secade – Exactly, one is cosmetic and the other is obscuring. @Fatcat723 – @slmret – Impressive, isn’t it? @CurryPuffy – Maybe Kennedy Road? @beowulf222 – Would be fascinating to see more pictures of how that area developed over the years.